But the story is similar for every team today, except Williams. We can all go to sleep tonight dreaming that they have a Brawn 09' up their sleeve, but the reality is very different. We saw their new driver, Formula 2 champion George Russell, in the paddock today, and their 2018 car is in the garage in Spain dressed up in the new livery, but the rest of the team are back in Oxfordshire, working hard to get the new car ready in time - hopefully by Wednesday according to Claire Williams, the deputy team principal. George Russell, spoke earlier to Sky Sports, he said: "I want to be out on track and the team is working hard to get everything sorted, I don't think it will compromise us too much." But we shall see what happens over the next few days. We will be back tomorrow from 08:00 GMT, with more coverage of F1 testing in Barcelona. As the team bosses point out, lap times aren't exactly important in testing, because it's about collecting data, testing parts, and not showing all your cards at once. Although it's great to see Sebastian Vettel at the top of the tree all day after a poor end to last season, it's not exactly a solid marker to outline the overall performance of the new car, and himself. He did have a minor spin in this morning's session, which may not seem like a huge drama, but it was those mistakes which cost him the championship in the second half of last year. However, it's the first day the drivers have had their tyres on tarmac this year, and let's not forget we have seven more days of testing, and the other half of the field are yet to get in the car. Elsewhere in the pitlane, Red Bull have had a promising day with Max Verstappen driving over 100 laps with their new Honda engine and no faults - which is a huge step up to what Honda engines were capable of since they returned to the sport in 2015. Verstappen says in his concise post-test interview: "So far so good. We did a lot of laps so I'm happy, but its only the first day so I can’t comment on the rest. We’re happy and we’ll keep improving like everyone else." Lap times should not be overplayed on the opening day of testing but this has been an encouraging start to pre-season for McLaren. Zak Brown admitted there were issues with their installation of the Renault power unit last year, and the wheels literally fell off as Fernando Alonso ended up in the gravel on the first day in 2018, but this season has seen both reliability and a place near the top of the timing screens. Brown said last week that the way the Renault power unit is packaged this year would be improved, but even so the atmosphere was one of caution as the team shied away from the bold statements of 12 months ago. That outlook hasn't changed, but there is a sense of relief at McLaren after a solid start to 2019, with even the one stoppage for Carlos Sainz this afternoon not costing the team much track time. Raikkonen has stopped again. The man who caused our first red flag of the day, has caused our last. No dramas though he's stopped on the side of the track. However, that concludes our session for the day anyway. As you can see, some teams haven't done as many laps today - just 30 for Sergio Perez, and 53 for Haas overall. David Sanderson: Since a lot of the F1 results during a season are driven by developments, are UK based teams likely to hindered by Brexit - meaning Ferrari have an edge?? Andrew Ogley: That Ferrari definitely looks orange... someAnone will be in trouble before the racing has even started. Chris Doherty: Well done Pirelli, I had doubts but you didn't let me down.....you made the tyre compounds even more confusing now. Andy Hollis: Ferrari have said they’ll prioritise Vettel it necessary for the first part of the season. Ugh. Let the kid race. Andrew Benson says: "The 2019 compounds are similar to last year’s hard (C1), medium (C2), soft (C3), ultra-soft (C4) and hyper-soft (C5), but just feature slight changes to compounds and construction." 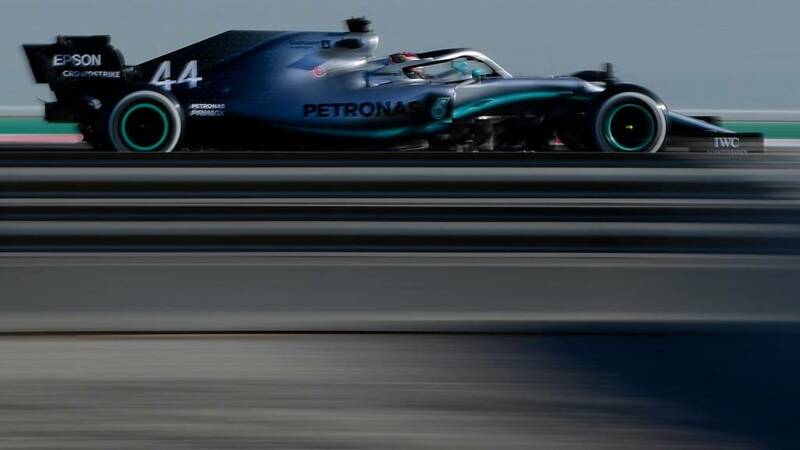 And F1 journalist Chris Medland, says: "Then there is an unmarked tyre that is a prototype featuring a slightly different construction with 2020 in mind. Pirelli has started work on next year early because it wants to finalise those compounds by the end of September to then focus on 2021 tyres, when the wheels will change from 13 to 18 inches." (The Twang - from 2009, if you're not familiar). Kimi Raikkonen joined Sauber in 2001 as his entry into F1 from Formula Renault. He didn't even have a superlicense. This year we see him back in Sauber uniform, 18 years on. He hasn't aged at all. You can read more about the Finnish legend here. Let's have a thumbs up, if you're also in the office today. OK, tyres. In an attempt to simplify things this year, tyre supplier Pirelli has reduced the number of dry-weather compounds available through the year to five from seven, and at each race they will simply be called soft, medium and hard, indicated by red, yellow and white markings on the sidewall. So far, so easy. But of course it’s not that simple. The soft, medium and hard at each race will not necessarily be the same as at another race - they will be chosen from the five options, which are known as C1 (for the hardest), C2, C3, C4 and C5 (for the softest) - once Pirelli have decided which compound set will be more suitable for each track's characteristics. So hard tyres fore demanding tracks like Silverstone and Suzuka, for example, soft ones for undemanding ones (for tyres) like Monaco, Canada and so on. The idea is that casual fans can be less confused by the names, but enthusiasts can still understand which tyre is being used at each track. For testing, all five compounds are available. The three colours remain the same, but the C1 and C5 compounds will have white and red lettering, like the C2 and C4, and will be differentiated by the lack of what Pirelli call brackets on the sidewall - what others might call lines - between the logos. Not the easiest thing to spot at 200mph, but there you go. F1TW11: The honey badger is out and buzzing like a bee. I am hopeful of progress for Renault, challenging for the occasion podium, and maybe wins in 2020. Richard: Surely some mis-reporting going on here? Over half way through Day 1 of testing and McLaren haven't suffered an engine failure yet.......?!? Vettel is still top of the leaderboard. But as Christian Horner said, let's not get sucked into the fast times on the board. We do have seven more days of this. Christian Horner, Red Bull's team principal says: "It's been a positive start we've done 101 laps and its all about learning about this RB15. You get sucked in on the first day with the times on the board - it’s a quick time from Seb, but what you don’t know is the fuel levels, the energy levels, the compound of tyre. But it's good to see the car running that quick, and you can see the aerodynamics haven’t slowed them down like it was speculated. "The car is running problem free at the moment, we are learning about the engine and the procedures and it's a very good starting point. The engineering is beautifully incorporated into the car, and it’s good to see it performing well so far. On Brexit: "Brexit is confusing for everyone. Do you understand what it is? Of course we do all the due diligence to take the right measures and everyone needs to know what it is, and what's going to happen - deal or no deal." Max Verstappen is third on the timing screens but it is his lap count - approaching 100 laps - that is of more satisfaction for Red Bull team principal Christian Horner. “The main focus is getting miles on the board and understanding that complex marriage between engine and chassis that seems to be going well so far,” Horner said. Speaking of Honda engines. Red Bull seem to be getting on well with their new Honda engine. It's only day one of the cars being on track this year, so I don't want to curse it so soon, but so far so good. How are those Honda engines, Toro Rosso? Franz Tost, team principal of Toro Rosso, speaking to Sky Sports, says: "This year we made a big step forward because we had more time to work with Honda and integrate the power unit was better than last year. The designers went into more detail and the car looks quite well designed, so I hope we will see this in the performance as well. "Honda made big progress over winter, on reliability and performance. It depends how much the power unit has developed from the other competitors, as to how it will perform overall."